His main enemy is the money worshipping Count Scroogeness. The Count makes money by lowering the quality of all sort of merchandise (example: a radio is bought, it's new and it works fine. Exactly one year after it's purchase, the warranty runs out and then - kaboom... it blows up. That's the kind of 'timeclock' things that Scroogeness builds into products). Comments: Thanks to Ronald Byrd for first informing me of this character. 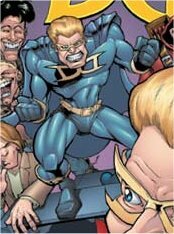 Dukse Drengen appear to have made his debut in a comedic TV show, before gaining his own comic from Danish company Cool Comics. They will be releasing his title in English in America as of next year. Thanks to Hans Christian Vang of Cool Comics for providing information and history for this character. Jais Christensen points out with respect to his television debut that "The show was a comedic show and was nothing like the comic. As I recall it, DukseDrengen was not a mutant in the TV show and he was kinda a wimp... He didn't have big muscles and looked somewhat like a geek! The fun of the show was that a guy like him (Arno) could be a hero.. He didn't fight Natte Ravnen in the show. I don't remember his enemies but seems to recall something about schoolteachers and such..."
Another, anonymous, correspondent remembers the old TV show, and notes "It is a bit funny that it has become a "real" action hero, cause the tv show was a bit of a parody of superhero shows, and actually had a bit of a "Wake up Geeks, fat capitalists are stealing your money, go get laid instead" moral. It was typical Danish humor of the late 80's. One thing which was pretty cool was, that it was highly manipulating, as you watched the show, you also watched the people at a public service channel who wrote the story, being bought by a big multinational Danish corporation, only because the only thing they didn't own was a tv network. After that part of the show, it had a new look to really give the impression that the show now had a new investor, and there was more money for special effects. Strange things started to be a part of the show, including the man behind the multinational corporation giving "Dukse Drengen" a special watch, and insisting on him drinking soda pops (things the tv show pretended to warn against earlier, as a little parody of American political correctness) But now a (fake) commercial ad for the Dusksedrengen soda and the Duksedrengen Watch were a part of the tv show, demonstrating how much power money has to influence our lifes."